Yep, another Pin It and Spin It! I have fun with this idea that my friend Gina From Desperately Seeking Gina came up with where you find something on Pinterest and make it, but do your own variations either to fit needs, tastes or whims. 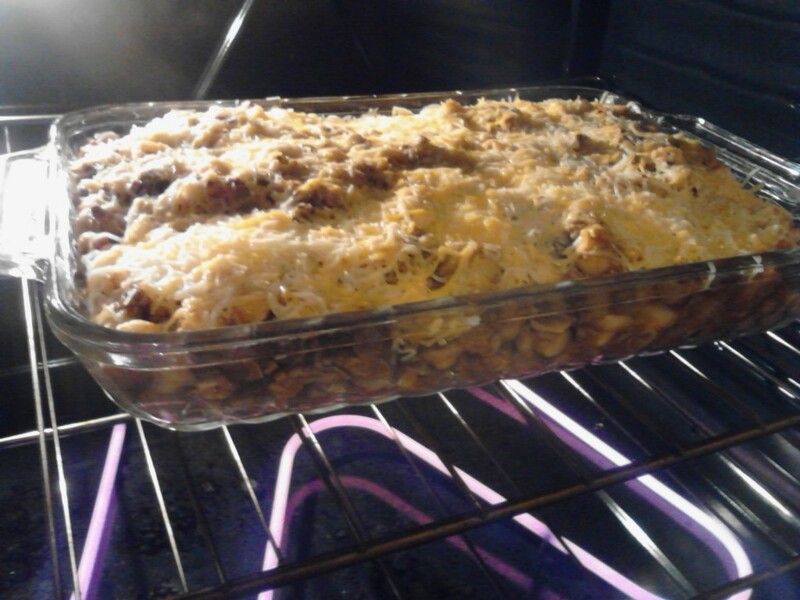 I found this recipe for Macaroni and Beef bake from Ruhlman.com and John and I decided it sounded good for our weekend meal. We both like Hamburger Helper type stuff but I have a very bad reaction to it so we rarely have it (I never do). We thought this was a great thing to try as a homemade substitute. When we read the recipe more closely, we realized that we didn’t want to make it exactly the same way. What came out ended up being almost all different ingredients or cooking methods. Once we finished, we realized ways we could or should have made this differently. It’s tradition to repeat the original recipe in one of these blogs but ours was so different I will simply share what we did and comment on the original recipe. We thought it was a little too dry so we will blend some cheese in with the pasta/meat mix or do a layer of the pasta/beef then a layer of cheese then a layer of the pasta/beef then the top cheese. This was a little bit too much pasta but adding more beef would have made way too much food. Adding anything else to this recipe would require it to be split into two dishes. Next time we might cut out a little bit of the pasta or use smaller pasta so that the ratio is better. John chose the cumin and pepper because it’s what his grandma used in her goulash (by the way, you can add a can of corn and basically you have goulash). If we had used Mexican seasonings or Italian seasonings, it would have created a completely different kind of dish. John tried this a few days after we made it and added mustard and chopped pickles to his serving. He swears it’s just like a cheeseburger pizza. What have you been pinning and making lately? Check out more on Gina’s Pinterest Board. Back in my meat-eating days I would have gobbled that up. It looks sooo good. Not much pinning & spinning going on these days that aren’t wedding related 🙁 Must work on getting some recipes knocked out, though!